The EF 8-15mm f/4L Fisheye lens is a highly-anticipated and unique lens in Canon’s lineup. I’ve been using it for a couple of weeks now and will give a hands-on “user report” review of it below. First off, I’ve used the 8-15mm almost exclusively with my 5D Mark II, so most of my comments are directed toward its application on a full frame camera. I used it briefly with the 7D just to get a feel for the difference, which I’ve noted below. The 8-15mm has been a lot of fun for me. I like to get my hands on gear that makes me take different approaches to what I’m comfortable with. 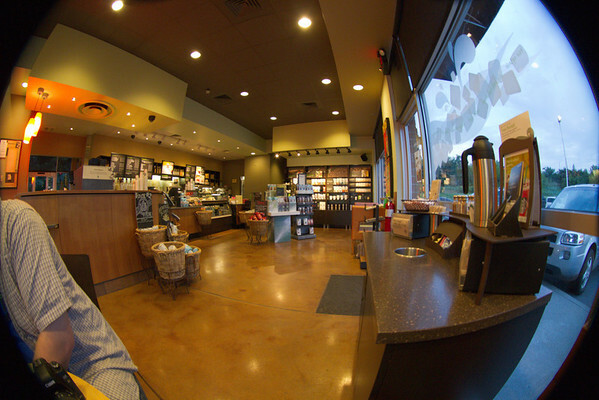 Wide angle is certainly different for me. And, while I’ve had a 17-40mm f/4L in my bag for a few years, it’s probably the least used lens I own. 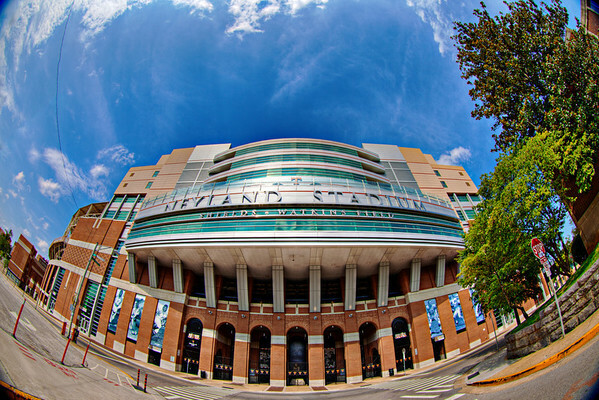 So, this fisheye lens is in a complete different ballpark for me. 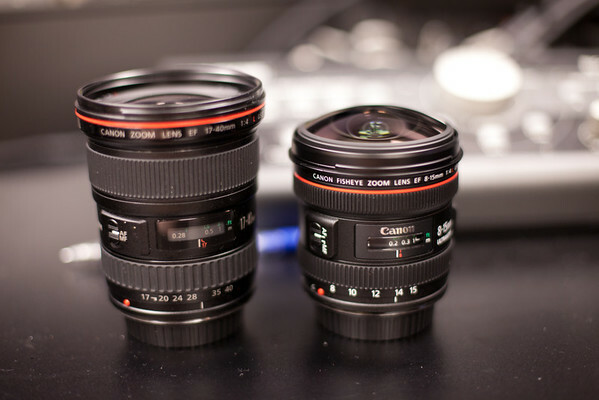 Size-wise, the 8-15mm f/4 is marginally smaller than the 17-40mm f/4. 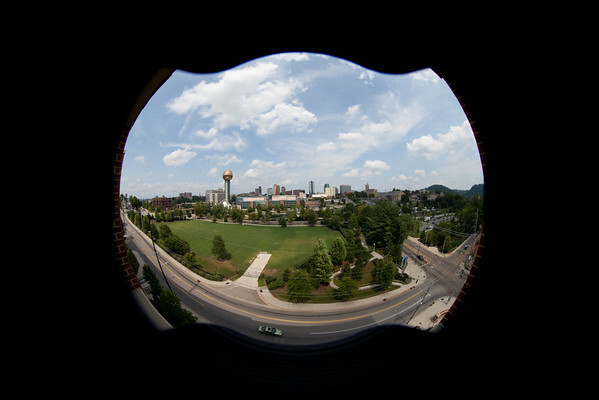 The protruding, bulbous front element on the 8-15mm lens is both exciting and a bit frightening. Having that much glass just hanging out of the front of the lens makes me nervous. It’s a good thing that it comes with a nice petal lens hood and custom fitted front cap that snaps on the front of the hood. The hoods has no problem staying securely attached to the lens; however, I’ve had the cap come off a couple of times during transit in my camera bag. Being a fisheye lens, you are going to be working with distortion in your shots as an artistic element, which was my biggest challenge – but one that I had fun with and very much enjoyed. I was constantly changing the level at which I shot, as well as the angle/tilt of the camera in order to manipulate the distortion’s prevalence in my images. Likewise, I found that I change my distance to various elements in the composition in order to emphasis or diminish their presences. While this process is relevant with many other lenses, the effects are amplified with this lens due to the overwhelming distortion. 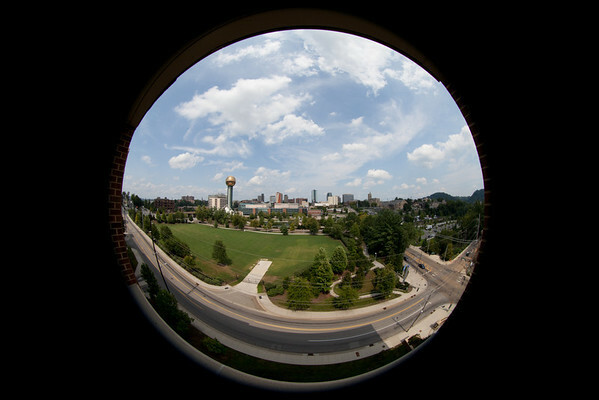 On a full frame camera, you are limited to the 14-15mm focal lenghts before vignetting sets in. And depending on your focus point, you may be stuck to 15mm only. While the circular image at 8mm can present a cool effect in certain situations, the lens hood is very ugly when used at 8mm. See the examples below. 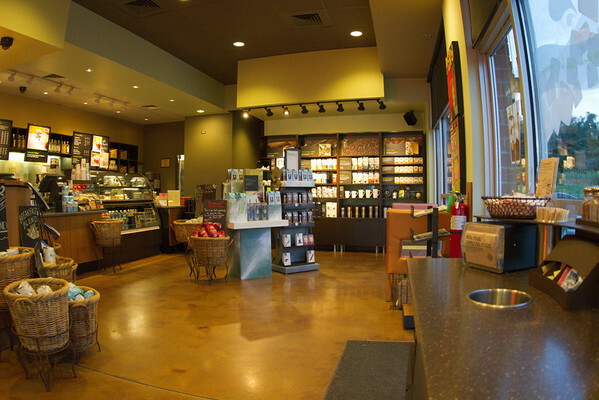 For the sake of comparison, below are a few images I grabbed with a 7D and 5D Mark II in a Starbucks. As you can see, there’s a big difference in the field of view on a full frame camera and an APS-C frame camera with this lens. 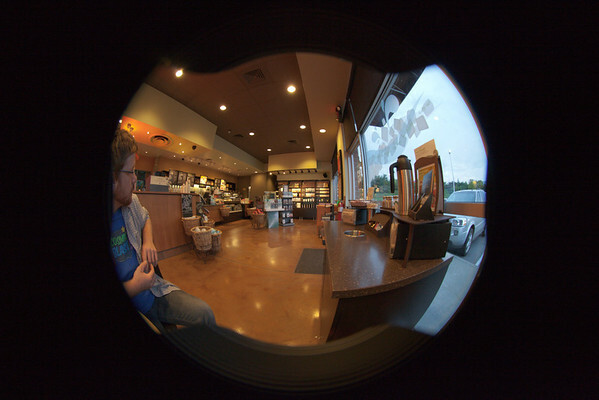 The thing you notice above is the vignetting hits at totally different places with the 5D and 7D. On the 7D, you can back off to about 10mm before you start having a bad vignetting problem, which puts you at a field of view equivalent to 16mm on the 5D. Canon provides markers on the side of the lens barrel to show you where the image circle covers APS-C and APS-H format cameras. As noted above, the APS-C range goes down to 10mm, while the APS-H range goes to about 12mm before vignetting sets in – a handy feature that maximizes the transition of this lens throughout Canon’s DSLR lineup. I also tried my hand at some video with the 8-15mm and found some pretty cool uses. 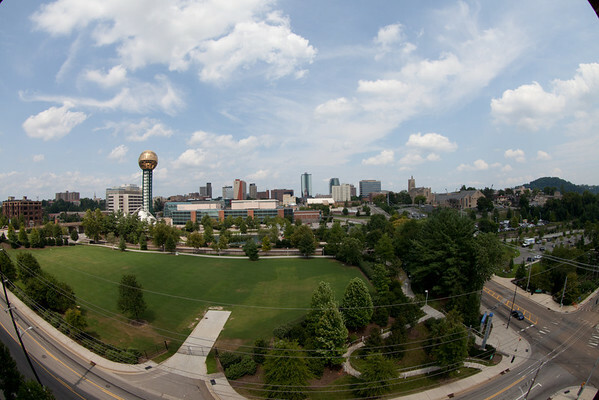 At around 15mm, it offers a pretty cool POV shot – just a super wide shot. I could see this coming into play in scenes where there is a lot of peripheral action going on and you want to provide a rather chaotic view from the first-person perspective. The other great effect of using this for POV or action shots is that you can hand hold the camera due to the extreme wide angle and not suffer greatly from camera shake. Because it is so wide at 15mm, the shake is minimized, which is not something we get away with very often when using HDSLRs. The second type of shot that I think this could work on is large crowd shots. Specifically, the 8-15mm will let you put a given subject front and center for a big part of the frame and then pull in a big environment for at the peripheral. 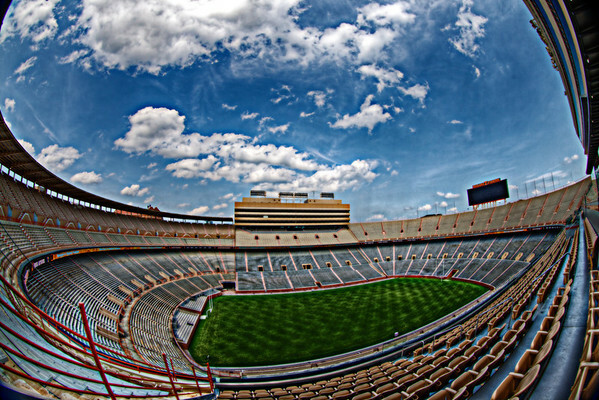 Again, you’re getting a specific “look” from the fisheye, but you can show a massive crowd without much height. 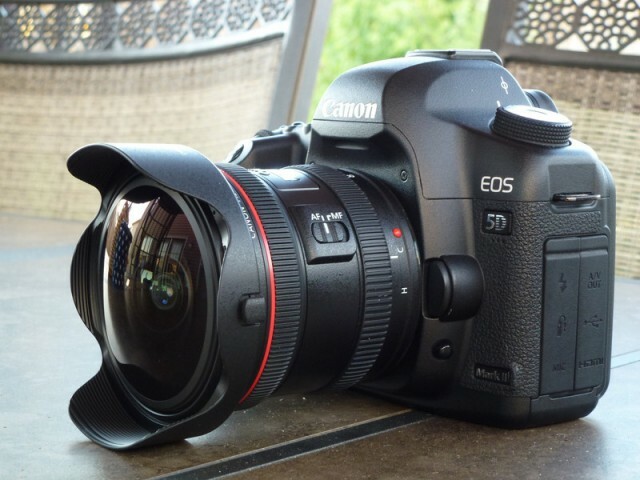 All in all, the EF 8-15mm f/4L lens is a fantastic lens. I was unsure how I would feel about working at such extreme wide angles; however, it didn’t take long for the lens to push me into finding new ways to see the same things. As an L lens, it’s not cheap at around $1500; however, it can be well worth the price of admission for those willing to put it to proper use. Those HDR photos are way over processed with bad haloing and over saturation. 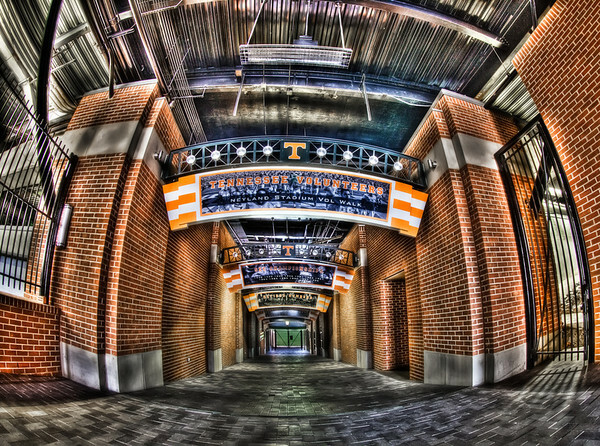 Those types of photos are what has been giving HDR a bad name. Just my two cents. This was a helpful look at a unique lens. 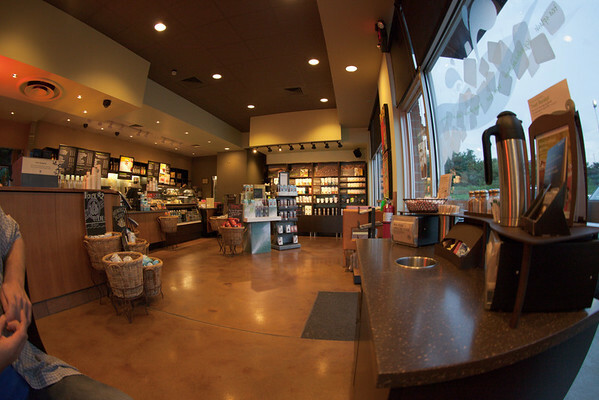 Unlike the author, I do shoot primarily wide angle but the 8-15 doesn’t do much for me. I’d much rather see a highly competent 14-24 in Canon’s lineup. I’ve heard a lot of other folks using wide-angles asking for a 14-24mm Canon lens in the same vein of Nikon’s. I’ll keep my fingers crossed for you guys. Hey, any test done on a 1.3 crop body like on the Canon 1D series? Great review. I played with one of these in a local shop and thought the same about that front element sticking out. That’s an awful lot of glass to mess up! This looks like it might be fun for a while but how often would I use it to justify the purchase? 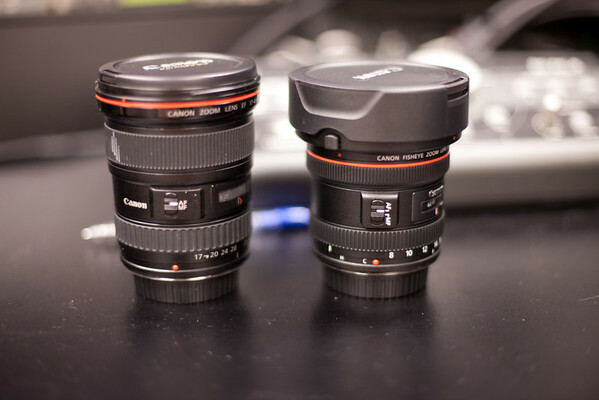 I will stick with my Canon EF 16-35mm f/2.8 L II .